Cracked Tooth Syndrome (CTS) – A tooth may exhibit pain with pressure, which can be a sign of an internal fracture, usually due to a previously placed amalgam filling that expands and contracts with temperature changes. The only way to prevent the tooth from flexing is to place a crown to hold the cusps together. Root Canal - After root canals, teeth tend to become brittle and are more apt to fracture. These teeth need to be protected by a crown. Why Choose 21st Century Dental for Dental Crowns? Dental crowns strengthen and protect the remaining tooth structure and can improve the appearance of your teeth. Crowns can be made from different materials which include the full porcelain crown, laboratory-fabricated composite crown (Sinfony©), the porcelain fused-to-metal crown, and the all-metal crown (gold or precious metal). You and our doctors will decide which type is appropriate, depending upon the strength requirements and esthetic concerns of the tooth involved. Fitting a crown requires at least two appointments. 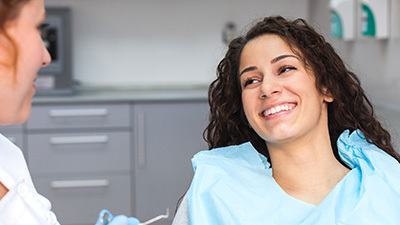 During your first visit, the tooth is prepared for the crown, an impression or mold is made of the tooth, and a temporary crown is placed over the prepared tooth. At the subsequent visit, the temporary crown is removed and the final crown is fitted, adjusted, and cemented into place. Once you are numb, the doctors will prepare your tooth in a very specific way in order to maximize the retention and esthetics of your new porcelain to metal crown. After the tooth is fully prepared, we proceed with the impression stage. At times, we use a thin piece of retraction cord that is placed around your tooth in order to get the impression material under the gum where the crown ends. Should you experience any discomfort, you can take a mild analgesic (Tylenol™, Advil™, Anacin™, etc.) as long as there is no medical contraindication based upon your medical history. Typically, you can take anything you would normally take for a headache. If the discomfort persists, please call us. Once the impression stage is completed, we will place a temporary (transitional) crown on your tooth. These plastic (acrylic) restorations are placed on teeth to protect them and the gum tissues between dental visits. The temporary cementing medium used is designed to allow the easy removal of the temporary at your next scheduled visit. Sometimes, even with meticulous care, temporary crowns may become loose between visits. If this should occur, please place the temporary crown back on your tooth immediately. Putting a drop of Vaseline™ in the temporary crown will very often increase the retention and hold the temporary in place until you can schedule an appointment. Once again, REPLACING THE TEMPORARY CROWN IMMEDIATELY IS VERY IMPORTANT! It only takes a short time for teeth to move if the temporary is not put back into its proper position. This could affect the final restoration significantly and may necessitate new impressions and a great deal of time. If you cannot replace the temporary crown yourself, put it in a safe place and call the office. We will be happy to recement it for you at the earliest possible moment. At your second appointment, the temporary crown is removed and any temporary cement is cleaned from the prepared tooth. 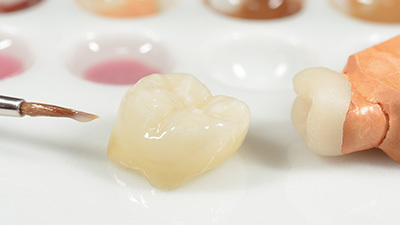 We will fit the final crown, check for accuracy, adjust for any bite discrepancies, and evaluate the esthetics. If all of these factors are acceptable, the crown is cemented to your tooth. It is not unusual for the new crown to be mildly sensitive to cold temperatures for a few weeks. 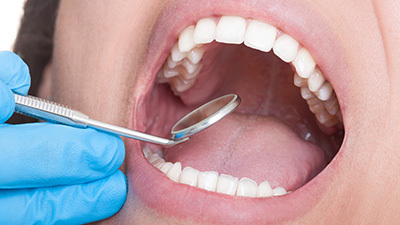 However, if the sensitivity is severe, does not subside, or if the bite feels uncomfortable, contact us. Further adjustments to the crown may be necessary.